The Mandarin originates from Far East and is one of the most spectacular waterfowl species, it has been maintained in captivity for many generations and is a species well suited to anyone new to the hobby but because of the exquisite beauty of the adult males plumage there are not many collections that do not have at least one pair of Mandarins. In the Far East the Mandarin is considered as a sign of fidelity and a pair may be given as a wedding gift, while Mandarins do not necessarily pair for life they do form very strong pair bonds and their courtship displays are very elaborate. Most species of waterfowl can and will hybridise with other species but there has never been a Mandarin hybrid. There are also a number of significant feral populations in the UK and there is a strong possibility that there are now more feral Mandarins in the UK than there are are in the Far East where the population has been under threat primarily from loss of habitat. Adult male Black Mandarin bathing. Adult male Silver Mandarin displaying. Mandarin readily become tame and confiding and in most instances will breed at one year of age. They have no complicated dietary requirements and will thrive on a diet of pellets, either poultry or waterfowl, along with wheat. The addition of bread, various Millet seeds and certainly meal-worms will very quickly get Mandarins settled. As with most waterfowl they very quickly learn what meal-worms look like and these are a great supplementary feed for taming down new waterfowl. Mandarins can readily be maintained in an aviary with a small pond or on a lake and anything in between, they are very adaptable. If provided with a suitable nesting site in the spring they will almost certainly lay, in the wild they nest in hollow trees, frequently using discarded woodpecker nest sites. Consequently in captivity they like to have a nest box that can be at ground level but they have a preference for a raised box. See the page on nest box design and placement for more details. The clutch will usually consist of between 9 and 12 eggs and incubation is usually around 30 days. Most Mandarin females will happily incubate but they will also readily recycle if the clutch is removed for artificial incubation. 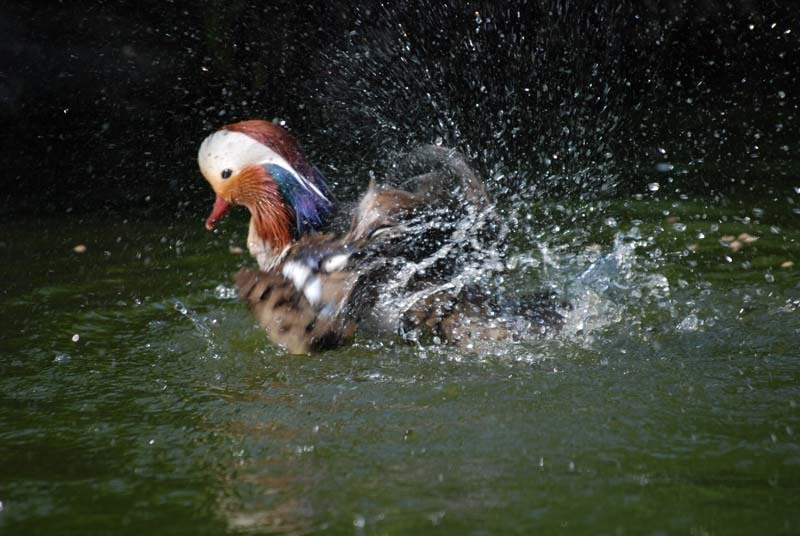 In captivity many waterfowl do not necessarily have much success at rearing their own young and Mandarins are no exception and in most circumstances artificial incubation and rearing will produce better results. 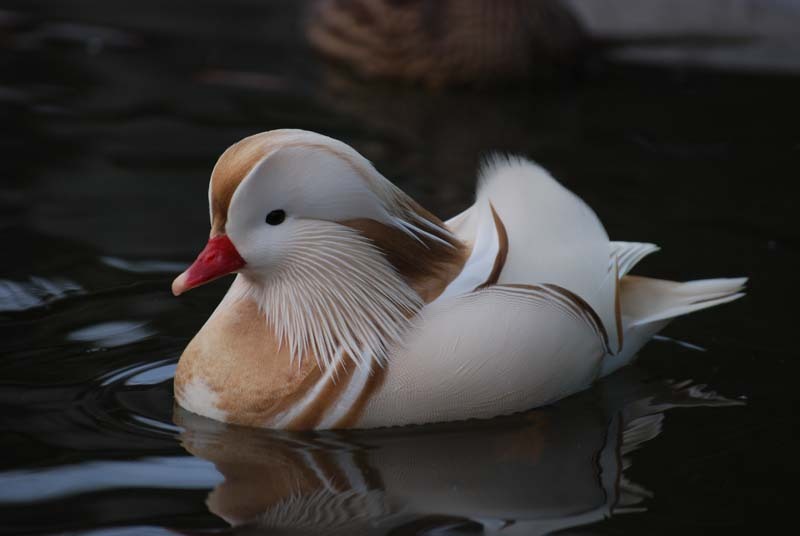 After many generations of captive breeding a number of colour variations of the Mandarin have occurred, it is now possible to get Mandarins in Blond, Silver / White, Ginger and Black. 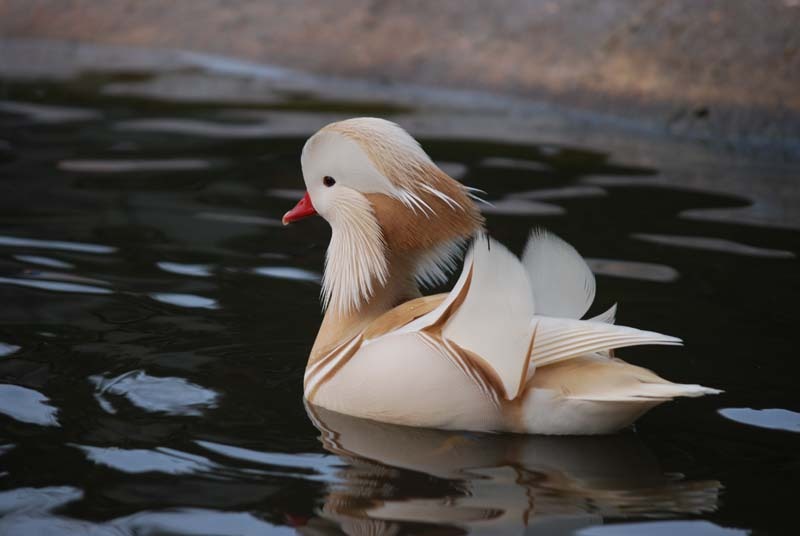 A silver Mandarin drake in full plumage is a particularly impressive sight and there is variation in this colour form. In the generally accepted silver form the females are pure white with a bright red bill and the males are almost white but with feather definitions showing as a light buff and again with the red bill. 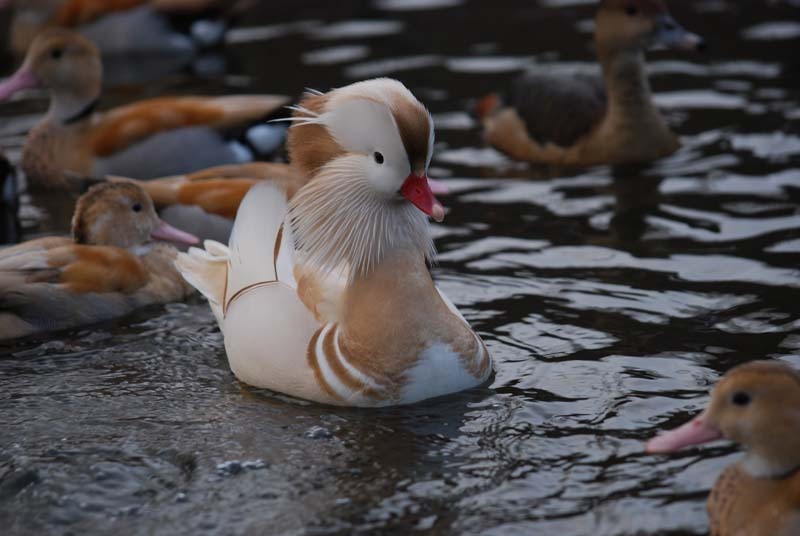 The variation on this colour form sometimes referred to as Platinum produces females that show feather definition in light buff and the males have a strong feather definition in buff. This new form still needs some improving but really is striking. With the blond form the male is not dramatically different in appearance to the normal male, it is only the wing feathers that are substantially different and these are buff / brown and in the normal they are virtually black. The females are very obviously blond and are dramatically different to the normal female and also have a bright red bill. With the blond mutation sunlight has a significant impact on the feathers which fade over time and the blond appearance becomes more obvious. The Black Mandarin really is not well named and chocolate would be more appropriate, the ducklings are born almost black but as adults melanistic or chocolate would be a more appropriate description. In normal Mandarin both the male and female have white bellies but in the black the bellies are very dark brown but they are not black. Mandarin ducklings are nearly always nervous and it is not until they are fully grown that they suddenly tame down. With Black Mandarins for some reason the ducklings are very docile and remain very confiding from the time they hatch. With many waterfowl the colour variations or mutations are more difficult to breed and certainly to rear, Black Mandarins seem and exception, fertile eggs hatch very readily and the ducklings are without doubt much easier to rear than normal Mandarins.